Given the complex and multidimensional nature of human evolution, we need to develop theoretical and methodological frameworks to account for and model the dynamic feedbacks between co-operational biological and cultural evolutionary systems to better understand the processes that produced modern human behavior. Equally important is the generation of explicit theory-based models that can be tested against the empirical paleoanthropological record. We present a case study that examines evidence for culturally-driven behavioral change among Late Pleistocene hominins that altered the social niche occupied by hominins in western Eurasia, with consequences for subsequent biological and cultural evolution. We draw on a large sample of 167 Pleistocene assemblages across western Eurasia and employ mathematical and computational modeling to explore the feedbacks between cultural and biological inheritance. 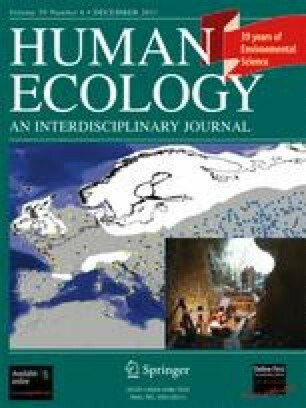 Shifts in land-use strategies changed the opportunities for social and biological interaction among Late Pleistocene hominins in western Eurasia with a cascade of consequences for cultural and biological evolution, including the disappearance of Neanderthals from the fossil and archaeological records, and the acceleration of cultural evolution among ancestors of modern humans. The online version of this article (doi: 10.1007/s10745-011-9433-8) contains supplementary material, which is available to authorized users. This research was supported in part by the National Science Foundation (grant BCS-0526073), and a Fulbright Senior Research Fellowship and Graduate Student Fellowship from the Committee for the International Exchange of Scholars. We want to thank Kim Hill, Bill Kimbel, and Geoff Clark for their comments on versions of this manuscript. We are, of course, fully responsible for all ideas and their expression herein. Holdaway, S., and Douglass, M. (2011). A Twenty-First Century Archaeology of Stone Artifacts. Journal of Archaeological Method and Theory doi: 10.1007/s10816-011-9103-6.